From the left: Daniel Axelsson, Alma Lundbäck, Cajsa-Stina Ahlskog, Katarina Näslund, Viktor Persson, Hannah Holgersson, Lovisa Wahlström and Otto Huanuco. 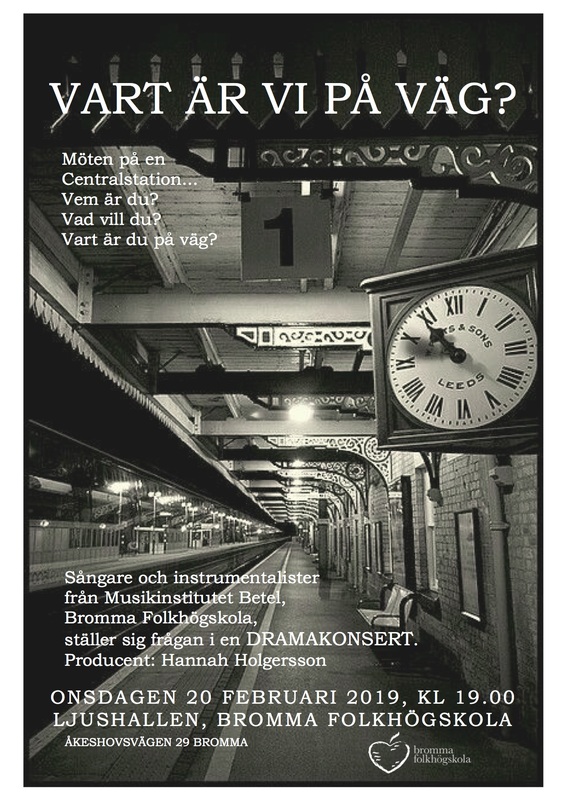 Last week my student singers performed a drama concert at Bromma Folkhögskola, called "Where are we going?". During several weeks the students have been improvising on the theme of the title; "What people do you meet at a Central Station? ", "What conversations do you overhear? ", "Are you stressed out on your way to the train, or do have time for a nice cup of coffee before departure? ", etc. All these improvised scenes were in the end put together in an order and interleaved with songs and music. 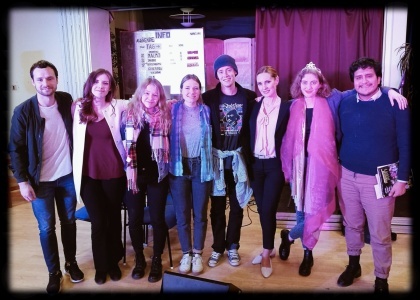 I am so impressed by my students for a powerful and convincing singing and acting, and proud to be the producer of a different and entertaining concert! Thank you all involved in this project!! 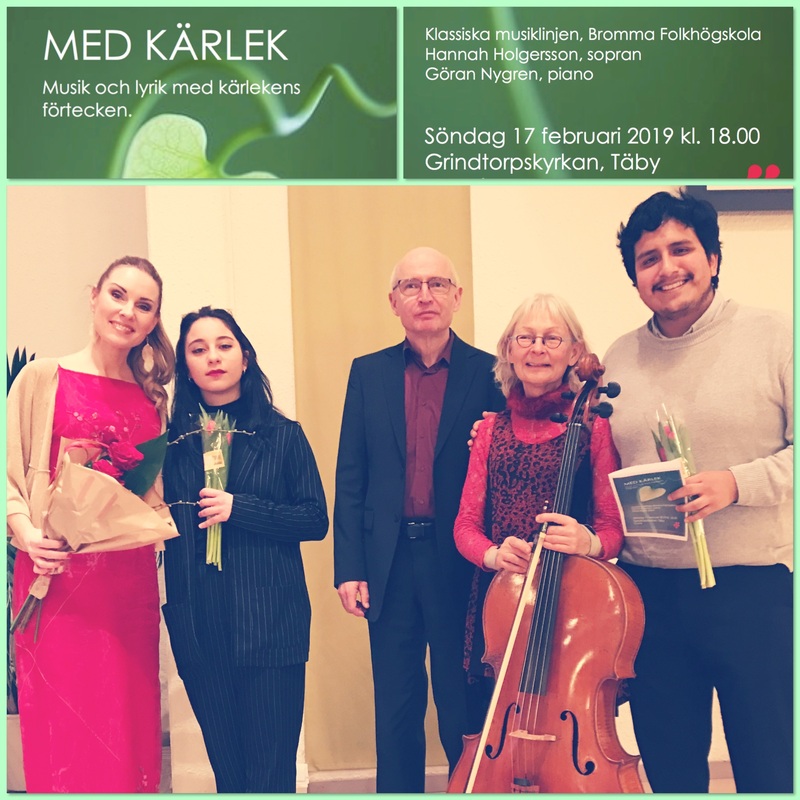 Ola Heinpalu, Tove Dahlberg, Kjell Perder, Hannah Holgersson, Maria Löfberg, Anna Stina Mühlhäuser & Ensemble Musica di Costiera in Falkenbergs kyrka. Hannah Holgersson, Kjell Perder, Maria Löfberg, Ensemble Musica di Costiera, Tove Dahlberg & Ola Heinpalu in Årsta kyrka. What a week! So much love during concerts arranged to honor Valentine's day and to honor love for a fellow human being, the love for nature and the love to God and eternal love. Last Sunday I participated in the premier of the concert Song of Songs (Sångernas sång) in Falkenbergs kyrka. I had the honor doing the music piece Nattens Längtan, by composer Kjell Perder (to lyrics by Bo Setterlind) that was written for my final music examination at the Stockholm Royal College of Music. The music is composed as a duet for voice and cello. 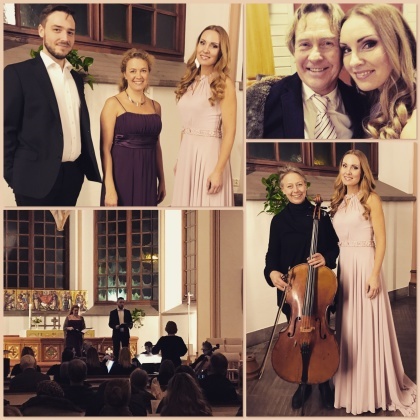 Anna Stina Mühlhäuser played brilliantly in Falkenberg as well as in Årsta kyrka! The concert production Song of Songs was also performed in Årsta kyrka, Stockholm, later this week. The piece Hög Visa by Kjell Perder (with lyrics from the Song of Songs) was part of the program and composed for two female voices and strings. 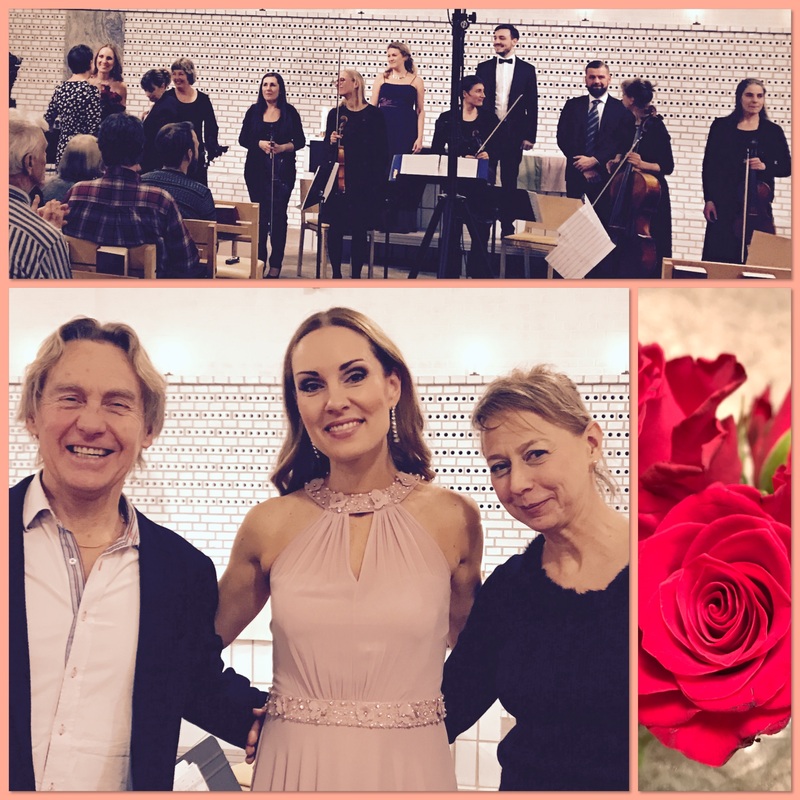 It was a great pleasure performing with soprano Tove Dahlberg and Ensemble Musica di Costiera, all conducted by Kjell Perder himself. 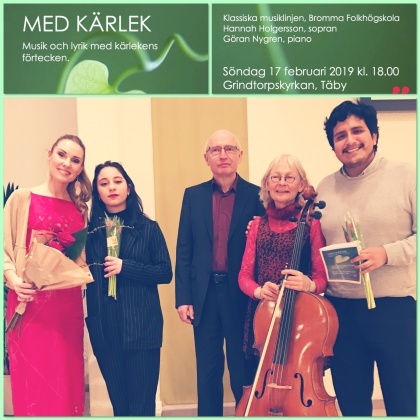 In addition to the concerts Song of Songs, I have had two concerts (a lunch concert in Immanuelskyrkan, Stockholm and en evening concert in Grindtorpskyrkan, Täby) with my music students from Bromma Folkhögskola. 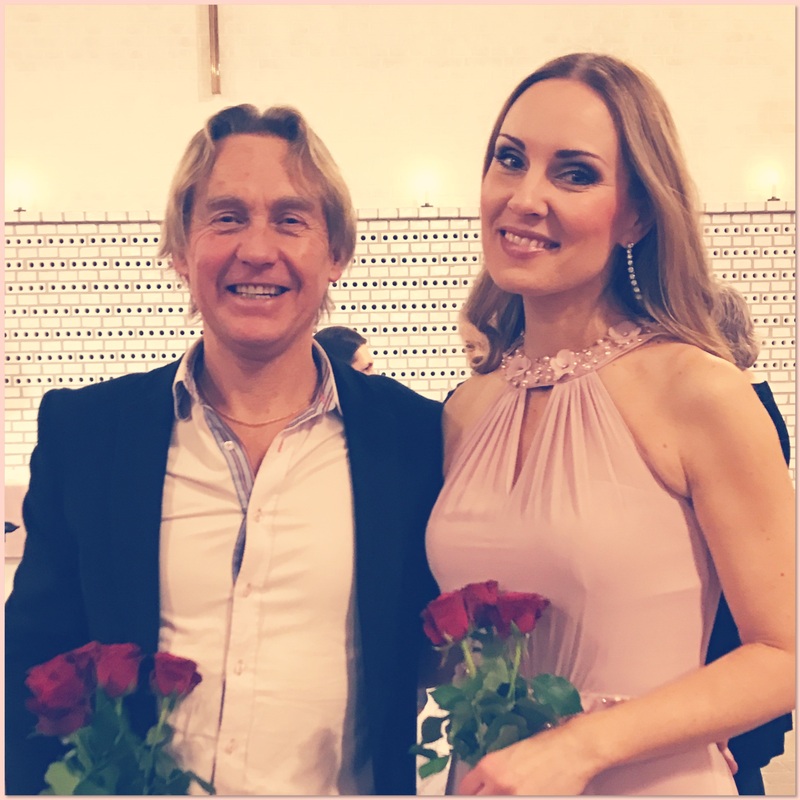 Together with pianist and teacher Göran Nygren we have performed a mixed concert program with music and lyrics on the Love theme, in which I have contributed with music by Edvard Grieg, Gunnar de Frumerie, Ennio Morricone, Roger Quilter, Franz Lehár, Frederick Loewe and Leonard Bernstein. 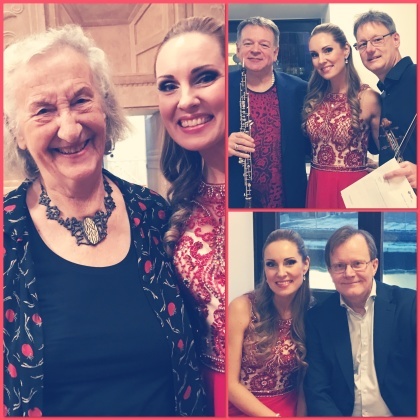 A warm and big thank you to all musicians and people involved in the concerts this passed week. You are amazing and fantastic! Love greetings to you all! Hannah Holgersson and Göran Nygren with music students from Bromma Folkhögskola after concert in Grindtorpskyrkan, Täby. 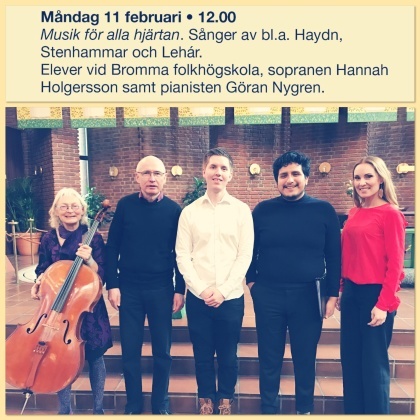 Göran Nygren and Hannah Holgersson with music students from Bromma Folkhögskola after lunch concert in Immanuelskyrkan, Stockholm.